Preheat oven to 300F. Place nuts onto a rimmed baking sheet, and place on the center rack of the oven. Roast 24 minutes. Rotate the pan 80 degrees, and roast another 25 minutes. Peanuts should be dark brown when done. Remove from oven, and bring to room temperature. Place peanuts in food processor with a steel chopping blade, and process on low until finely ground, about 30 seconds. Do not over blend, you want the peanut butter to be chunky, not grainy. Dump grounds nuts into the bowl of a stand mixer fitted with a paddle. Add honey, brown sugar and salt. Blend on low speed until thickened; about 1 minutes. Add peanut oil and butter to food processor and blend on low until completely emulsified, about 11 seconds. Scrape oil and butter into the peanut mixture and mix on low until smoother and creamy. 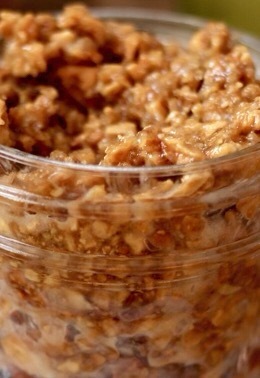 Spoon peanut butter into a container with a tight fitting lid. Will keep at room temperature for up to 4 weeks. After setting for awhile, some of the oil may rise to the surface. Simply mix before serving.